(A4O/ By Sinke Wesho |18 August 2013) – Jiitu Wakjira was only five years old when Ethiopian security forces took away her father, Dhabasa Wakjira, from their home in April 2004. Jiitu understood very little at the time, but remembers missing her father, whom she visited at Ethiopia’s notorious Kaliti prison every weekend – for nearly three years. On Saturday Aug. 10 2013, Jiitu, 14, described her family’s ordeals, in a heartfelt speech that read much like a movie script, before a captive Oromo and Australian audience. Exposed to politics, suppression, oppression and loss at a young age, Jiitu’s is a story of love, perseverance, resilience, and courage. The event was organized by members of the Australian Oromo Community Association in Victoria to celebrate a reunion of a family torn apart by years of injustice. Lalise Wadajo, Jiitu’s mother and former journalist with the state-run Ethiopian Television, was arrested on October 30, 2008 and later sentenced to 10 years without parole for alleged associations with the Oromo Liberation Front (OLF). Lalise arrived in Australia early this month after serving nearly three years in prison. At Waltz Matilda hotel in Springvale ballroom, where the event was held, a family photo of the Wakjira’s beamed from two screens. The iconic photo shows Dhabasa and his children hugging Lalise as if to never let go off her again. The story of the Wakjira’s resonates with many in the Oromo diaspora – separation from loved ones, despair and triumph of longing to see each other again. Tables were filled with Oromo traditional food, decorated with an Oromo flag and Oromo attires greeted entrants from all directions. The auspicious dinner was followed by remarks from the family and a Skype call from Dr. Trevor Truman, human rights advocate and chairman of the UK-based Oromo Support Group. “Galatooma,” said Dr. Truman thanking the organizers in Afan Oromo. “Lalise ani gammade jira” – I am so happy for you, Lalise. Dr. Truman said he was thrilled about Lalise’s release and subsequent reunion with her family. He then commended Lalise for her patience and perseverance in the face of harsh and inhumane treatment in the hands of Ethiopian authorities – something he knows all too well having worked with Oromo refugees over the last two decades. Unable to finish her five-page speech, Jiitu sat next to her parents, wiping tears off her angelic face. As Toltu Tufa – who campaigned and lobbied the Australian government on Lalise’s behalf for years – narrated the rest of her story, Jiitu fought back tears and as did everyone else in the room. Even in such an emotional moment, the teenage Jiitu was humble and graceful. The roomful audience was sniffing in tears. Jiitu described how confused and lost she was to witness the alternative imprisonment of her parents. She recalled the first time her father was arrested – with no warrants or accusations. Jiitu remembers the federal police breaking into their house, interrogating her father, and confiscating her video games, tapes of her parent’s wedding and certain newspapers. For the next two years, every time she visited her father in prison, the impressionable Jiitu saw hundreds of Oromos at Kaliti prison. “My dad told me that I once asked [him], ‘Did you know Qaliti is Oromia’s ‘capital’ city?’ He had asked ‘Why?’ to which I replied, “Because all Oromo[s] are here. They all speak Afaan Oromo.’ I’m guessing I didn’t view it as a prison back then but more like a meeting hall for all Oromo people to converse,” Jiitu said of the infamous prison on the outskirts of Addis Ababa, Ethiopia’s capital. The room was dead silent, filled only with sniffles, as Jiitu chronologically detailed the harrowing story of the Wakjira’s. But Jiitu’s excitement did not last long as Dhabasa soon escaped a probable arrest and left for exile first to Kenya, and eventually resettled to Australia. Hopelessness set in for Jiitu not knowing if she would ever see him again. “I didn’t understand that he was gone for his own safety, in fact, back then, I preferred the first departure than the second. At least then, I got to see him weekly [in prison],” Jiitu wrote. Then the police took her mother – literally leaving her and two younger siblings without parents. The day Lalise was arrested, Jiitu was returning home from school, after taking a major exam, to tell her mother how easy it was. Upon arrival though, Jiitu watched in horror and confusion as her mother was whisked away by uniformed security personnel. Jiitu screamed and cried for her mother as the officers slamming the door on the pickup truck. “I will be back,’’ Jiitu recalled her mother saying as the truck drove off. “Who was going to take care of us…Where’s mom going?” Jiitu remembered pondering as she embraced her baby brother, Bonsen. Jiitu once again found herself trekking back to Kaliti, this time to visit her mother, unlawfully convicted for no other reason than being Oromo. Separated from both her parents, Jiitu had to learn to be an adult at a young age. But there was another hurdle. She attended school six days a week. This meant she could only see her mother on Sundays, missing church, which upset her aunt Mastawot. Jiitu remembers seeing girls younger than her age living in prison quarters whenever she visited her mother. In one instance, Jiitu describes how her eyes were fixated on a young girl, about seven or eight years old, apparently living in prison, until Jiitu’s mother distracted her with a candy. Unable to comprehend why a girl her age was doing at Kaliti prison, Jiitu asked her mother for explanation. “To this day, I do not understand why an innocent young girl who was obviously not capable of doing any harm to the government [was] in prison,” Jiitu said in her speech. In Nairobi, I had a better understanding to why my parents were arrested. It turned out they were not an exception, they were just Oromo people. I couldn’t get my head around why they were arrested though. Taking pride in one’s country shouldn’t have been a crime. It shouldn’t have been frowned upon; it should be accepted and encouraged. Jiitu’s father, Dhabasa, a former journalist and community activist, spoke next. He admitted that when he lodged the family reunification application in August 2011, he did not believe that this day would come; a day when he would see his beloved wife sitting next to him with all her family. On July 3, 2013, Lalise was granted a visa to travel to Australia. After a long torturous eight years of waiting, they were reunited on in Melbourne on the morning of Aug. 8, 2013. The mood in the room turned somber. Next, Lalise took the stage to a standing ovation – beaming in an Oromo cloth painted with Odaa, the symbol of Oromo democracy, with beads around her neck and forehead. Her confidence and charisma was contagious. 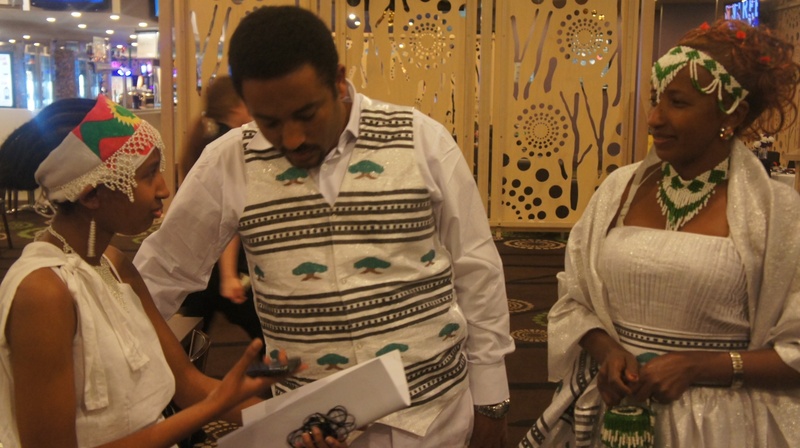 “Galatooma,” she told members of the Australian Oromo Community for standing by her family during the long ordeal. She was humble but clear and eloquent; Lalise spoke about ongoing systematic oppression of the Oromo people and the quandary of Oromo political prisoners. A remarkable storyteller, by the time Lalise was done speaking, the crowd seemed as if wanting to hear more. As a woman and young person, I was filled with feelings of love and rage. I was enraged because an innocent woman was dehumanized, separated from her family, her husband and nation with no reason. But I also fall in love with her, in part because this was the first time I saw my community celebrating a heroine. Although women have been the backbone of Oromo struggle, little has been said about their contribution and ordeals. Even when recognized, there is little or no follow up. Women’s place still feels at the house while men carry the flag of advocacy. Celebrating Lalise I felt I was seeing the light at the end of the tunnel. Witnessing Lalise’s and Jiitu’s journey, I felt this was the beginning of ‘bilisummaa’ or freedom for Oromo – by embracing half of its population. Families and invited guests joined in celebratory Oromo dance after the formal event. Lalise looks like every Oromo daughter, mother and a wife. But she has borne too much a loss just for being an Oromo. For the Oromo nation though, Lalise’s children – the fruits of long and arduous struggle – are now the hope and leaders of tomorrow. I have no doubt her story of both struggle and triumph, when and if told, will inspire millions across the globe. Jiitu, now an Oromo rights activist, ended her speech with a quote from Martin Luther King: Freedom is not voluntarily given by the oppressor; it must be demanded by the oppressed . She urged those in the room to fight injustice and support the Oromo people’s struggle. In the airport, I started getting worried because she was one of the last people to arrive. Our eyes were darting around looking for her until Bontu yelled ‘She’s here’ and they started running towards her. I didn’t greet her until I got over the fact that she was there. I did try to stop myself from crying but how could I not? The minute we hugged, my hands were just tight around her neck and I was tearing up. I knew people wanted to greet her too but I didn’t want to let go. Even though mom is here with us and the missing puzzle to our family was complete, there are still others suffering under the Ethiopian government. There are still parents with children like me suffering and yet putting their children’s safety in front of theirs …We owe them, I owe them a lot of things and we should never take our freedom here for granted. *The writer, Sinqe Wesho, is a Melbourne-based human rights activist and former public relations officer for the Australian Oromo Community in Victoria. She can be reached for comments at arfasabill@yahoo.com.au. Photos by Alula Mosisa, an engineering student and freelance photographer based in Melbourne, Australia. He can be reached at falmata430@hotmail.com.